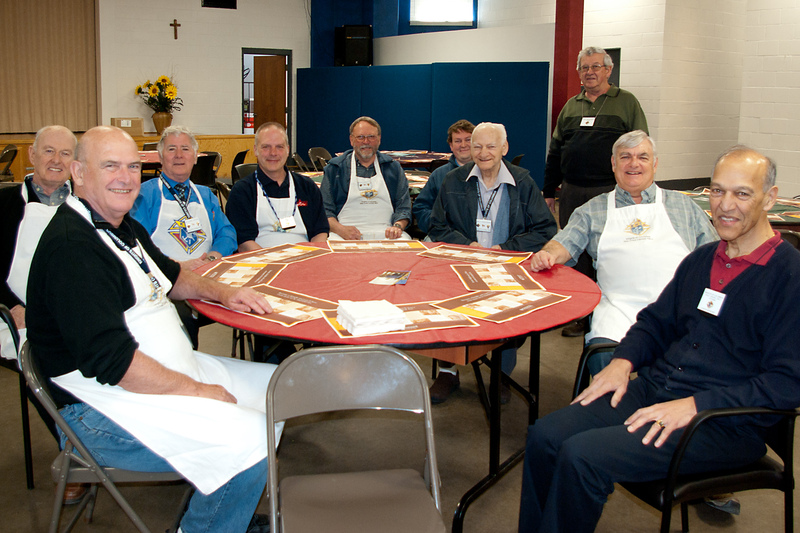 The knights at our council, 10617, hosted another in our series of pancake breakfasts this morning. Parishioners come down to the church hall after each morning Mass to enjoy pancakes, ham, coffee, tea and juice with their families and friends. They linger to catch up on the latest doings with their friends, and they visit with people they otherwise wouldn’t meet. Behind the scenes, there’s a flurry of activity involving a team of about 20 Knights. The shopping gets done on Friday morning, tables are set up on Saturday, and the cooking, serving and clean-up all happen Sunday. The coffee is on by 7:00 a.m., the cooks start flipping pancakes by 8:00 and the first guests arrive by 8:45. It’s generally 2:00 p.m. before the last guests have left and the clean-up is complete. Part of the team that hosted the pancake breakfast, April 21, 2013. Our breakfasts are fundraisers, with a twist. Instead of setting a price for the meal, we simply accept a free-will offering. People offer what they can and no one is turned away for lack of a donation. Each event is devoted to a particular cause. During this fraternal year, our causes have included purchasing wheelchairs, contributing to the education fund of a deceased member’s children, buying winter coats for a dozen needy children and supporting the education of seminarians. This entry was posted in In the pews and tagged KofC by joegoski. Bookmark the permalink.